They told me that they could use a bit of help with some of the rigging. The project is interesting and I need this kind of experience and so, after a few failed attempts, I finally met with them online via video chat. I mentioned that I had been working on something rigging related on my own for awhile now that could be of use to the project. 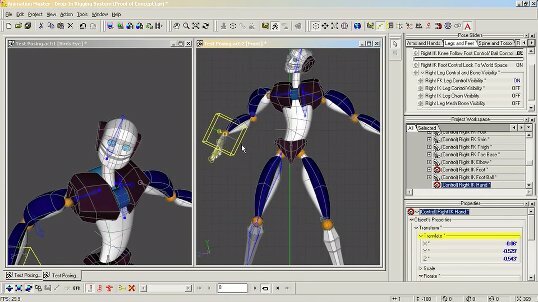 What I am talking about is that I’ve wanted to develop a faster and more flexible way to rig a character in Animation Master (with a complex rig if desired) without having to go through the steps necessary to install a good rig like Mark Skodacek’s A:M 2008 Rig or David Simmon’s Squetch Rig. I like rigging… but setting up a rig from scratch on every character that I want to animate is a lot of work. If you watched my previous video on installing the A:M 2008 rig you might come to the conclusion that even that simplified install process can get to become quite a chore after awhile too. There used to be a plug-in for Animation Master called The Setup Machine which was produced by Anzovin Studios. What that plug-in allowed an artist to do with his or her character model was to position into place only the bones that would be directly attached to the model without having to interact with the rig’s substructure and controls during the install process. When the process was completed the artist would then be able click a button or two and have the complete rig that The Setup Machine installed. That plugin for Animation Master is no longer supported by Anzovin Studios anymore but the concept behind it is something that I wanted to revisit. I call it the “Drop-In” method since one of the hardest steps of the process is dragging and dropping the rig file into the model file in Animation Master’s project workspace 🙂 . It is a way to install a sophisticated rig without the need to deal with anything except the bones that the model will be directly attached to. This greatly simplifies the rigging process so that more artists can have the means to install a good rig into their models. The process involves using relationships in A:M’s in conjunction with hidden pre-positioned bones while working in an Action file within A:M.
This method versus a method like The Setup Machine allows a rigger to have the flexibility to setup more than one type of rig. So if I want to install the A:M 2008 Rig in a way similar to the way it was done with The Setup Machine then I can do that. If Id prefer to try the Squetch Rig I can setup the file that contains the bone and relationships that I need to get it done. This video is something that I put together quickly for Steve and Chris so if you watch it you will hear me addressing them in some parts. This video is for you too since I was eventually going to post something like it anyway for anyone interested in this type of thing to watch. The rig that I use in this video is something that I call the Poker Rig (a play on the acronym PoCR for Proof of Concept Rig). It is a customized rig that is based heavily on the A:M 2008 Rig but not as high tech. It is not the rig that will be used for the coffee shop project. I’ll follow up soon with a video demonstrating the use of this method with one of the characters form this project.